This Multi-Boat trip is perfect for large families, an office trip, wedding parties, or just a gathering of friends. Your group will depart out on our 22' 2018 Mako Center Console along with our 2019-24' Blazer Bay Center Console, and will head out side to side taking you to the best offshore reefs and wrecks the Gulf has to offer all while staying in Alabama or Florida State Waters. Nothing like a little friendly competition! Your Capt' s. will be dueling to get your group on the biggest fish and of course grab some groceries for your cooler. 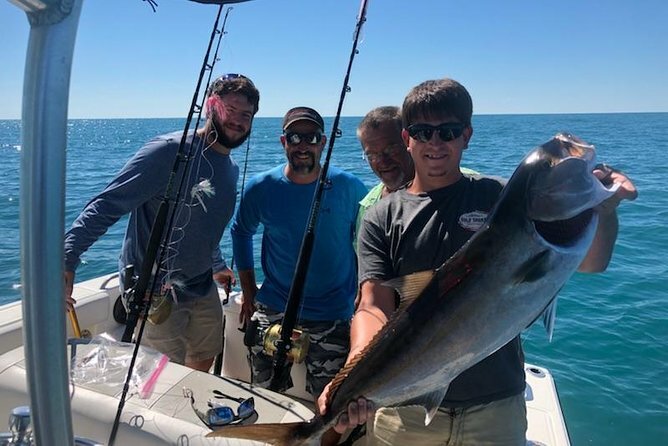 You will have fun hooking up on some huge Amerbjack, Red Snapper, Grouper, Triggerfish, Cobia, Vemillion, Lane and Mangrove Snapper and a host of other species the Gulf holds. At the end of the day one group will end the day with bragging rights, but everyone will walk away with an experience of a lifetime and a complimentary t-shirt to commemorate their trip to Orange Beach, Al and with Blue Water Charters. You will arrive at Bear Point Marina approximately 10 minutes prior to your departure time where Capt. James, your U.S. Coast Guard Licensed Captain will be there to greet you and assist you on board. You are welcome to bring any drinks or snacks as we have a large YETI cooler on board to store them in. We do provide bottled water and Gatorade at no additional charge. You will be stepping on board our 2018 22' Mako Center Console running on a Mercury Verado 250, the boat is rigged with the latest and greatest electronics that include a Minn Kota Terrova trolling motor with I Pilot and Spot lock, a Lowrance 4G radar and Lowrance Carbon 12 Chart/Sonar, Sirius XM Marine Weather, Bluetooth Stereo, Sat Phone and Personal Locator Beacon, and also padded seating all around to keep you comfortable on the water. Our recent addition to Blue Water Charters, our 2019 24' Blazer Bay Center Console running on a 300 Suzuki, this boat is also rigged with the latest and greatest electronics that include a Motor Guide trolling motor with I Pilot and Spot lock, a Simrad EVO 12 Chart/Sonar, Bluetooth Stereo, Sat Phone and Personal Locator Beacon, 35 Gallon and 30 Gallon Live Bait Wells, 16 rod holders, Hydraulic Jack Plate. All the required safety equipment is found on board all of our vessels as safety is a priority for all of our guests. Don't forget a small cooler with ice to leave in your vehicle should you wish to bring your catch home with you. Subject to favorable weather conditions. If canceled due to poor weather, you will be given the option of an alternative date or full refund, no-shows will be charged full price.